Henley Rowing Club’s juniors section travelled to Dorney Lake to compete at the Marlow Spring Regatta on Bank Holiday Monday. Because of the poor weather affecting the Marlow regatta fields, the event has hastily rescheduled to the Olympic course at Dorney. 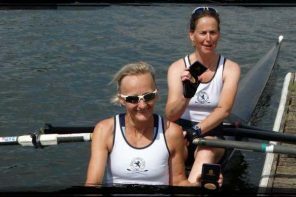 The club achieved seven wins in a full day of competitive racing over the 900m course. The morning session brought the first two wins of day. Georgia Edwards in a WJ15 single scull won the B event easily, with Lauren Kay finishing a strong second in the A event. 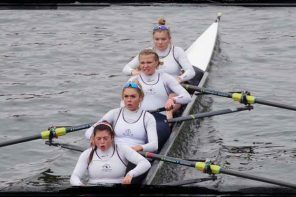 This was shortly followed by a win for the WJ15 eight of Iona McNab, Lily Stimpson, Katie Beale, Ella Wandless, Alicia Redman, Clare Pearson, Hannah Gutteridge, Anna Roe and cox Rebecca Lister. 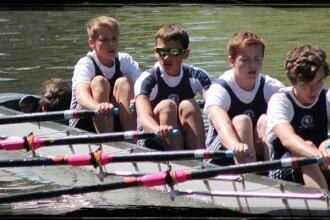 The J14 boys were racing in their first regatta of the season and they came away with their first trophy. The crew of Will Properjohn, Cameron Jones, Nick Spicer, and Jack Broadbent with cox Lachlan Reid had to fend off two other strong crews to win J14 coxed quad event. The boys then formed two doubles with Bruce Turnell stepping in, but were unsuccessful against two strong crews from Maidenhead and RGS High Wycombe. The WJ14 octople of Eve Poulter, Caitlin Copland, Tilly Lock, Charlotte Moss, Ruby Brown, Georgina Robinson Ranger, Lottie Orr, Issy Jonsson and Gemma Sarney as cox defeated Latymer school in the opening round, but lost a pulsating final to Headington School A by the narrowest of margins. The octople then split into 2 coxed quads with Amelia Fielding Smith replacing Caitlin Copland and Ellie Crook as second cox. Both crews won through to the final where the coxed quad of Ruby Brown, Georgina Robinson Ranger, Lottie Orr, Issy Jonsson and cox Gemma Sarney running out victors with the other quad in 3rd place behind Kings Chester. The afternoon session brought a further three wins for the Henley Juniors. The WJ15 coxed quad of Katy Claridge, Clare Pearson, Ella Morgan, Florence Wiggins, cox Rebecca Lister won against a strong field of crews from Headington School, Marlow and Guildford Rowing Clubs. 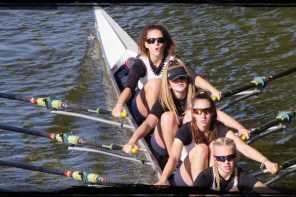 The WJ16 quad of Katie Beale, Katy Claridge, Clare Pearson, Anna Roe won in a straight final against Eton Excelsior and Marlow Rowing Club. The final win of the tremendous day for the Henley club came from the WJ16 eight of Lauren Kay, Lily Stimpson, Florence Wiggins, Maisie Turner, Hannah Gutteridge, Georgia Edwards, Ella Morgan, Emma Lister, cox Rebecca Lister.